These are those bible verses that are never mentioned, when one wants to describe Christianity as a woman oppressing religion. “Husbands, love your wives, just as Christ also loved the church and gave Himself up for her” (v.25). This is really radical also today! How many of those who attack Christianity, would be able to fulfill this? And what was it at the time it was written, when a woman hardly had the value of a donkey! This is God’s commandment to men! This is how it’s going to be! You have this to live up to, not to get saved, but because it is after God’s will. “So husbands ought also to love their own wives as their own bodies!” (v.28). Who doesn’t take care of his own body! The one who by purpose breaks down his own body, he commits an unnatural, yes, abnormal act. The natural would be to care for it, for your bodily life depends on that it works well. 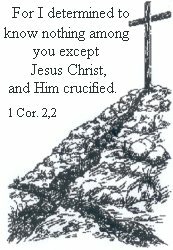 To not live completely up to this, is therefore sin – a sin you need daily forgiveness for, and daily repentance from. But this is also about something more, and deeper, than our human conditions, - it’s about Christ and the church, Christ and you. He, when He wants something, or sees something, active with us humans, it is His own He will see. He wants us to be the way He is. That is what lies as a foundation for God’s commandments, prohibitions and commands. It’s the law in one sum, it is God’s will, - this is how God is! And also here, how He wants the relationship between the spouses is how He wants His relationship with you. And just think about what is written about spouses: They are one! He wants to be one with you, - and that is also what happened, from the moment, when you started believing in Him, as your Savior and redeemer, given to you of the Father. You became one with Him! Jesus created a covenant: “This cup which is poured out for you is the new covenant in My blood.” (Luke 22:20). First: About this covenant – this blood – it says further: “…poured out for you” (Luke22:20b). Second of all: Do you think the Lord wants to break His covenant? And third of all – as you heard: This covenant is His blood! The blood is the covenant! – What is poured out for you. To an atonement for your sins. He is really your blood bridegroom! – He won you – He bought you – with His own blood. And He isn’t the one who breaks His covenant with you. If a divorce has to happen in a marriage, yes, at least one part must want to, and will go through with it. We understand that. But when we stand before the covenant we are dealing with here – the covenant He has created with you – who would then be the other part? Who would want a divorce, and go through with it? It had to be you! He who paid so much to have you, would He be the one to part with you again? Grasp this now! Paul calls it a secret, this relationship between the Lord and the congregation. This church of which it says: “He purchased with His own blood.” (Acts 20:28). You should be aware of this, when you read the word of God that for God people is never a flock, but always individuals. Also when it comes to the congregation, He never sees it as a mass substance. The congregation for Him is the individual together with the others. And then this, completely incredible, that He even has account on how many strand of hair we have on our head. He sees and pays attention to them all! – They are counted (Luke 12:7). Can you grasp that? And then He would look at the congregation as a mass substance! No, Christ and the congregation, is Christ and the individual, which together constitutes the congregation. Perhaps we ought to look at it more like that? Not think as church communities or organization names – because that means nothing at the end, no, not here and now either, if you are affiliated with something like that, - but the individual, who lives in a confidential communion with the Lord, on the safe foundation of the blood. That is the congregation! – The individual who Jesus has bought, paid and cleansed in His own blood, from all blemish and sins. And as it is said in our passage: He nourishes and warms it, as we nourishes and warms our own body. Remain in this, and think after – when you feel the hunger, you get something to eat, to calm this hunger. When you are freezing you wrap yourself in with your clothes well around you, so that you can keep warm, everything so that the body is comfortable. This is simple and easy and ordinary, but just think about that this is Jesus relationship with the congregation! He feels its adversity, sorrows, need and difficulties, as it was His own body. You are a limb on His body, says the Word (v.30). He can feel it when you get hurt, like you can feel a pain in your finger, in a foot or something else. Just think about how quickly you feel, and discover, pain and distaste. We cannot grasp His proportion to us, but it is worth to try and learn about it. Because “This mystery is great,” as Paul writes here (v.32). Is it strange that we so often goes empty and cold, as little as we seek into this. To be a part of “the activity,” as it is called, is not the same – and that is certainly not what we are speaking about here now! We are speaking about “His indescribable gift!” (2 Cor.9:15). That we are betrothed, with a man, to present a pure virgin for Christ, as it says in God’s word (2 Cor.11:2). We shall be aware for what we let our heart cling to – also what so called Christian activity is about. “For this reason a man shall leave his father and mother and shall be joined to his wife, and the two shall become one flesh” (v.31). One can put behind the things of old. And that means that that shall happen. When you have entered into a marriage, you are in a completely new life situation, a completely different one than you were in before, and you have to conduct yourself to that. Leave former things, not to be inverted, but because you are. You are one flesh with Christ!